Confirmation of her impeachment by the nation’s top court stripped her of immunity from criminal prosecution. SEOUL: South Korean prosecutors will summon former president Park Geun-Hye, whose impeachment was confirmed by the country's highest court last week, for questioning as a criminal suspect, a spokesman said Tuesday. Park has been named as an accomplice to the secret confidante at the heart of a corruption and influence-peddling scandal that triggered her dramatic downfall. "We will decide Wednesday when to summon former president Park and inform her," the spokesman of the Seoul Central District Prosecutors Office told AFP. It has not yet been decided whether Park will be called in to the prosecutors' office in private, or publicly before TV cameras and photographers, he added. The country's top court last week fired Park over a corruption scandal. Her friend and secret confidante, Choi Soon-Sil, is standing trial for using her ties to Park to force local firms to "donate" nearly $70 million to non-profit foundations Choi allegedly used for personal gain. Park is accused of offering policy favours to businessmen who paid Choi, including the heir to the smartphone giant Samsung, Lee Jae-Yong, who has been indicted for bribery and other offences. South Korean media and politicians have accused Park of defiance after told supporters on her return to her private residence -- following staying on in the presidential Blue House complex for several days -- that "the truth will eventually be revealed". 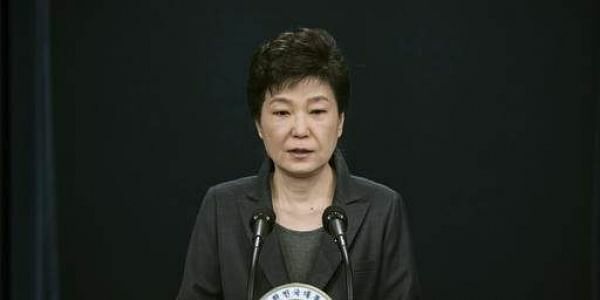 As president, Park refused to make herself available for questioning to special prosecutors investigating the scandal, despite multiple requests. Similarly the Constitutional Court asked her to appear before it as it held a series of hearings while considering whether to confirm or overturn her impeachment by parliament, but she did not do so. Park has been holed up in her high-walled house in southern Seoul, with hundreds of her diehard supporters staging sit-ins and vowing to "protect our president" from any harm. Clashes are expected if prosecution authorities try to force their way through the crowd surrounding the building to deliver the summons. A demonstration by thousands of pro-Park supporters following Friday's court ruling was marred by violence, with some attacking riot police and assaulting journalists. Three of the protestors -- men in their 60s and 70s -- died and dozens of people were wounded, including police and journalists. Park's fall gives South Korea an opportunity to draw a line under the scandal, which has been dominating the headlines for months, but plunges the country into a period of uncertainty, with a presidential election to be held no later than May 9. It comes as neighbouring North Korea shows increased signs of belligerence launching four missiles last week and describing them as a drill for an attack on US bases in Japan. Pyongyang has also been widely blamed for the killing of its leader's half-brother Kim Jong-Nam in Kuala Lumpur by two women wielding a banned toxic nerve agent. Park took a hardline stance toward the North over its nuclear and missile programmes, shutting down the lucrative Seoul-invested Kaesong industrial park in the North, the last legacy of the previous decade's inter-Korean rapprochement. North Korea's top newspaper Rodong Sinmun rejoiced over her fall Tuesday, calling her "The witch of the 21st century without an equal in the world". "Whoever perpetrates such sycophancy and treachery as leaving the nation's dignity and interests to the tender mercy of outside forces is bound to be cursed and buried in the grave of history," the daily said in a commentary. "Those who seek to live in luxury and comfort at the cost of sweat and blood shed by the people.... are fated to meet their miserable end by resistance of the angry public," it proclaimed. The current front-runner in South Korean opinion polls is former Democratic Party leader Moon Jae-In, who has advocated engagement with the North. A Korea Research poll for Yonhap news agency and KBS TV released on Sunday put Moon on 29.9 percent, well ahead of his fellow Democratic politician, South Chungcheong governor Ahn Hee-Jung on 17 percent. Acting president Hwang Kyo-Ahn, from Park's conservative Liberty Korea party, fell back to third place with 9.1 percent, it said.